For the band, see Drumlin (band). Drumlins around Horicon Marsh, Wisconsin. Note the curve (click to enlarge) in the direction of flow of the old Wisconsin Ice Sheet. This area has one of the highest concentration of drumlins in the world. Elongate and forested drumlins south of Puerto Williams, Chile. Flow direction here was at time of formation from west to east (left to right on picture). A drumlin, from the Irish word droimnín ("littlest ridge"), first recorded in 1833, and in the classical sense is an elongated hill in the shape of an inverted spoon or half-buried egg[clarification needed] formed by glacial ice acting on underlying unconsolidated till or ground moraine. Drumlins occur in various shapes and sizes, including symmetrical (about the long axis), spindle, parabolic forms, together with transverse asymmetrical forms; their long axis is parallel to the direction of movement of the formative flow at the time of formation. Drumlins are typically 1 to 2 km (0.62–1.24 mi) long, less than 50 m (160 ft) high and between 300 to 600 metres (980–1,970 ft) wide. Drumlins generally have a length:width ratio of between 1:2 and 1:3.5, with the questionable assumption that more elongate forms correspond to faster ice motion. That is, since ice flows in laminar flow, the resistance to flow is frictional and depends on area of contact; elongate, subglacial landforms produced by ice would represent relatively slow flow rates. Drumlins and drumlin clusters are glacial landforms composed primarily of glacial till. They form near the margin of glacial systems, and within zones of fast flow deep within ice sheets, and are commonly found with other major glacially-formed features (including tunnel valleys, eskers, scours, and exposed bedrock erosion). Drumlins are often in drumlin fields of similarly shaped, sized and oriented hills. Many Pleistocene drumlin fields are observed to occur in a fan-like distribution. The Múlajökull drumlins of Hofsjökull are also arrayed in a splayed fan distribution around an arc of 180°. Drumlins may comprise layers constituting clay, silt, sand, gravel and boulders in various proportions – perhaps, indicating that material was repeatedly added to a core, which may be of rock or glacial till. Alternatively, drumlins may be residual, with the landforms resulting from erosion of material between the landforms. The dilatancy of glacial till was invoked as a major factor in drumlin formation. In other cases, drumlin fields include drumlins made up entirely of hard bedrock (e.g. granite or well-lithified limestone). These drumlins cannot be explained by the addition of soft-sediment to a core. Thus, accretion and erosion of soft-sediment by processes of subglacial deformation do not present unifying theories for all drumlins—some are composed of residual bedrock. Conventional models of drumlin formation fall into two camps: constructional, in which they form as sediment is manipulated into shape, for example via subglacial deformation; and remnant/erosional, which proposes that drumlins form by erosion of material from an unconsolidated bed (reference). A hypothesis that catastrophic sub-glacial floods form drumlins by deposition or erosion challenges conventional explanations for drumlins. It includes deposition of glaciofluvial sediment in cavities scoured into a glacier bed by subglacial meltwater and remnant ridges left behind by erosion of soft-sediment or hard-rock by turbulent meltwater. This hypothesis requires huge, subglacial meltwater floods, each of which would raise sea-level by tens of centimetres in a few weeks. Studies of erosional forms in bedrock at French River, Ontario, Canada provide evidence for such floods. The recent retreat of a marginal outlet glacier of Hofsjökull in Iceland exposed a drumlin field with more than 50 drumlins ranging from 90 to 320 m (300–1,050 ft) in length, 30 to 105 m (98–344 ft) in width, and 5 to 10 m (16–33 ft) in height. 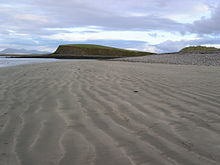 These formed through a progression of subglacial depositional and erosional processes, with each horizontal till bed within the drumlin created by an individual surge of the glacier. The above theory for the formation of these Icelandic drumlins gives the best explanations for one type of drumlin. However, it does not provide a unifying explanation of all drumlins. For example, drumlin fields including drumlins composed entirely of hard bedrock cannot be explained by deposition and erosion of unconsolidated beds. As well, hairpin scours around many drumlins are best explained by the erosive action of horseshoe vortices around obstacles in a turbulent boundary layer. Erosion under a glacier in the immediate vicinity of a drumlin can be on the order of a meter's depth of sediment per year, with the eroded sediment forming a drumlin as it is repositioned and deposited. Recently formed drumlins often incorporate a thin "A" soil horizon (often referred to as "'topsoil'" which accumulated after formation) and a thin "Bw" horizon (commonly referred to as "'subsoil'"). The "C" horizon, which shows little evidence of being affected by soil forming processes (weathering), is close to the surface, and may be at the surface on an eroded drumlin. Below the C horizon the drumlin consists of multiple beds of till deposited by lodgment and bed deformation. On drumlins with longer exposure (e.g. in the Lake Ontario drumlin field in New York State) soil development is more advanced, for example with the formation of clay-enriched "Bt" horizons. Drumlin field in Western New York state. The drumlins align with glacial flow. The retreat of Icelandic glacier Múlajökull, which is an outlet glacier of Hofsjökull, recently exposed a 50 drumlin cluster, which serves as the basis for improved understanding of drumlin formation. A steam train on the Downpatrick and County Down Railway in the drumlin belt of Ulster near Downpatrick in County Down, Northern Ireland. The literature also documents extensive drumlin fields in England, Scotland and Wales, Switzerland, Poland, Estonia (Vooremaa), Latvia, Sweden, around Lake Constance north of the Alps, County Leitrim, County Monaghan, County Mayo and County Cavan in the Republic of Ireland, County Fermanagh, County Armagh and County Down in Northern Ireland, Germany, Hindsholm in Denmark, Finland and Greenland. The largest drumlin fields in the world formed beneath the Laurentide Ice Sheet and are found in Canada—Nunavut, the Northwest Territories, northern Saskatchewan, northern Manitoba, northern Ontario and northern Quebec. Drumlins are common in central New York (between the south shore of Lake Ontario and Cayuga Lake), the lower Connecticut River valley, eastern Massachusetts, the Monadnock Region of New Hampshire, Michigan (central and southern Lower Peninsula), Minnesota, the Puget Sound region of Washington state, and Wisconsin. Drumlins, which are usually found in swarms or large groups, occur in every Canadian province and territory. Swarms of thousands of drumlins are found in Southern Ontario (along eastern end of Oak Ridges Moraine near Peterborough, as well as areas to the west near Dundas and Guelph), Central-Eastern Ontario (Douro-Dummer), the Thelon Plan of the Northwest Territories, Alberta, southwest of Amundsen Gulf in Nunavut and West Lawrencetown, Nova Scotia. The majority of those observed in North America were formed during the Wisconsin glaciation. Drumlins are found at Tiksi, Sakha Republic, Russia. Extensive drumlin fields are found in Patagonia, for example near Punta Arenas Carlos Ibáñez del Campo Airport and on Navarino and Gable Island in the Beagle Channel. In 2007, drumlins were observed to be forming beneath the ice of a West Antarctic ice stream. Discovery of the Namibian drumlins was reported in 2019. ^ "The planar shape of drumlins". Sedimentary Geology. 232: 119–129. Bibcode:2010SedG..232..119S. doi:10.1016/j.sedgeo.2010.01.008. Archived from the original on 2015-09-24. ^ Spagnolo, M.; Clark, C.D. ; Hughes, A.L.C. ; Dunlop, P.; Stokes, C.R. (2010). "The planar shape of drumlins". Sedimentary Geology. 232: 119–129. Bibcode:2010SedG..232..119S. doi:10.1016/j.sedgeo.2010.01.008. ^ Shaw, J.; Kvill, D. (1984). "A glaciofluvial origin for drumlins of the Livingstone Lake area, Saskatchewan". Canadian Journal of Earth Sciences. 21 (12): 1442–1459. Bibcode:1984CaJES..21.1442S. doi:10.1139/e84-150. ^ Patterson, C.J. ; Hooke, R.L. (1995). "Physical environment of drumlin formation". Journal of Glaciology. 41: 30–38. Bibcode:1995JGlac..41...30P. doi:10.1017/S0022143000017731. ^ a b c d Johnson, M. D.; Schomacker, A.; Benediktsson, I. O.; Geiger, A. J.; Ferguson, A.; Ingolfsson, O. (2010). "Active drumlin field revealed at the margin of Mulajokull, Iceland: A surge-type glacier". Geology. 38 (10): 943–946. Bibcode:2010Geo....38..943J. doi:10.1130/G31371.1. ^ a b Lesemann, J., Brennand, T.A., 2009. Regional reconstruction of subglacial hydrology and glaciodynamic behaviour along the southern margin of the Cordilleran Ice Sheet in British Columbia, Canada and Northern Washington State, USA. Quaternary Science Reviews 28, 2420–2444. ^ "Automated drumlin shape and volume estimation using high resolution LiDAR imagery (Curvature Based Relief Separation): A test from the Wadena Drumlin Field, Minnesota". Geomorphology. 246: 589–601. Bibcode:2015Geomo.246..589Y. doi:10.1016/j.geomorph.2015.07.020. Archived from the original on 2015-09-24. ^ Shaw, J., 2002. The meltwater hypothesis for subglacial bedforms. Quaternary International 90, 5-22. ^ A satellite image of the region of Hofsjökull where drumlin growth has been observed (see 64°39′25″N 18°41′41″W﻿ / ﻿64.65694°N 18.69472°W﻿ / 64.65694; -18.69472). The drumlins can be observed between pools of water. ^ Paik, J., Escauriaza, C., Sotiropoulos, F., 2007. On the bimodal dynamics of the turbulent horseshoe vortex system in a wing-body junction. Physics of Fluids, 19, 045107 1-20. ^ Shaw, J., 1994. Hairpin erosional marks, horseshoe vortices and subglacial erosion. Sedimentary Geology 92, 169-283. ^ Clark, C. D.; Hughes, A. L. C.; Greenwood, S. L.; Spagnolo, M.; Ng, F. S. L. (2009). "Size and shape characteristics of drumlins, derived from a large sample, and associated scaling laws". Quaternary Science Reviews. 28: 677–692. Bibcode:2009QSRv...28..677C. doi:10.1016/j.quascirev.2008.08.035. ^ a b c d e Clark, C.D. ; Anna L.C. Hughes; Sarah L. Greenwood; Matteo Spagnolo; Felix S.L. Ng (2009). "Size and shape characteristics of drumlins, derived from a large sample, and associated scaling laws". Quaternary Science Reviews. Elsevier Ltd. 28: 677–692. Bibcode:2009QSRv...28..677C. doi:10.1016/j.quascirev.2008.08.035. ^ Fiore, J. (2007). "Quaternary subglacial processes in Switzerland: geomorphology of the plateau and seismic stratigraphy of western Lake Geneva". Terre & Environnement. University of Geneva. 69: 169. Archived from the original on 2013-12-02. ^ O'Dwyer, Barry; Crockford, Lucy; Jordan, Phil; Hislop, Lindsay; Taylor, David (2013). "A palaeolimnological investigation into nutrient impact and recovery in an agricultural catchment". Journal of Environmental Management. 124: 147–155. doi:10.1016/j.jenvman.2013.01.034. ISSN 0301-4797. ^ Shaw, J., Sharp, D., Harris, J., 2010. A flowline map of glaciated Canada based on remote sensing data. Canadian Journal of Earth Sciences. 47, 89-101. ^ Kerr, Michael; Nick Eyles. "Origin of drumlins on the floor of Lake Ontario and in upper New York State". Sedimentary Geology. Elsevier. 193: 7–20. Bibcode:2007SedG..193....7K. doi:10.1016/j.sedgeo.2005.11.025. ^ "RootsWeb.com Home Page". freepages.genealogy.rootsweb.ancestry.com. Archived from the original on 27 November 2016. Retrieved 29 April 2018. ^ "Glacial landsystems and dynamics of the Saginaw Lobe of the Laurentide Ice Sheet, Michigan, USA". Quaternary International. 260: 21–31. Bibcode:2012QuInt.260...21K. doi:10.1016/j.quaint.2011.07.021. Archived from the original on 2015-09-24. ^ Toimi Uplands Subsection Archived 2016-10-21 at the Wayback Machine of the Northern Superior Uplands, Ecological Classification System. Minnesota Department of Natural Resources, 2016. ^ Goldstein, Barry. "Drumlins of the Puget Lowland, Washington State, USA". Sedimentary Geology. Elsevier. 91: 299–311. Bibcode:1994SedG...91..299G. doi:10.1016/0037-0738(94)90136-8. ^ Smith, A.M.; Murray, T.; Nicholls, K.W. ; Makinson, K.; Aðalgeirsdóttir, G.; Behar, A.E. ; Vaughan, D.G. (2007). "Rapid erosion, drumlin formation, and changing hydrology beneath an Antarctic ice stream". Geology. 35: 127–130. Bibcode:2007Geo....35..127S. doi:10.1130/G23036A.1. Easterbrook, Don J. (1999). Surface Processes and Landforms, 2nd Edition. Upper Saddle River, New Jersey: Prentice Hall. pp. 347–350. ISBN 0-13-860958-6. Grotzinger, John; Jordan, Tom (2010). Understanding Earth; 6th Edition. New York, NY: W.H. Freeman and Company. p. 586. ISBN 978-1-4292-1951-8. Tarbuck, Edward J.; Frederick K. Lutgens (2002). Earth: An Introduction to Physical Geography. Upper Saddle River, New Jersey: Prentice Hall. pp. 347–350. ISBN 0-13-092025-8. Trenhaile, Alan (2007). Geomorphology: A Canadian Perspective. Don Mills, Ontario: Oxford University Press. pp. 183–6. ISBN 0-19-542474-3. Wikimedia Commons has media related to Drumlin. Word of the day defines drumlin.